If you’re living independently for the first time, with a roommate or significant other, you’ll encounter a universal problem: people organize their lives differently. What seems to be clutter to one person will be organized chaos to another. This problem may appear irresolvable to some. If your roommate or significant other doesn’t think about what counts as clutter in the same way you do, how can you change their mind? Luckily, you don’t have to. Organizing a shared space isn’t about changing anybody’s idea of what is a mess and what isn’t. Actually, it’s just a matter of communication, like most other things, and respect. You live in a common space: you have common goals. Talk about them. 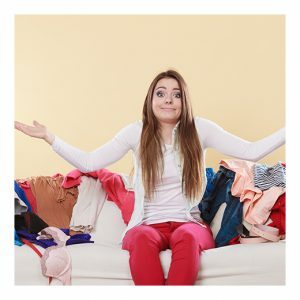 If you talk about clutter only when you’re annoyed about it, the way you communicate with your roommate or significant other may take the form of blame. You might say, “Why haven’t you picked up your laundry?” Or, “Why is this room still not clean?” This doesn’t do anyone any good. You live with someone. If you haven’t explicitly decided on what kind of organization you both would like to see for each room, then you cannot appeal to an agreed upon goal. The sentence, “Why is this room still not clean?” appears to be grounded in an agreed upon norm. And that’s why it’s so disorienting and, sometimes, maddening, when people talk this way without establishing, beforehand, what this agreed upon goal is. Talk about your shared interests, what each of you hope to get from your home, and make compromises. But certainly do not wait until you are aggravated, annoyed, or irritable to bring up how your shared space should be organized. State how you both want to use the room and accommodate each other’s visions. If your visions contradict, maybe split the space, or try to allocate different spaces for your separate visions. Agree upon the appropriate items for the space. Then talk about how you’d like to see them stored when not in use. Most of all be reasonable about your vision. You share space with another person. Sometimes you can’t get everything you want. No matter what you decide about organization, having a discussion about your goals, interests, and expectations is always healthy. And it’s certainly the best way to talk about clutter with your roommate or significant other.